CBS’s hit cop drama Blue Bloods does it again! And wow, did they do it powerfully! Friday’s episode, “My Brother’s Keeper,” once again depicted the risks that police officers face on the job and the trauma it can cause them off the job, especially with a liberal press and anti-police sentiment adding to their trauma. This episode is one of the most powerful ones I have ever seen from this show, as it went in-depth into the private pain of a hero in blue who accidentally kills a little girl while in the line of duty. As he becomes consumed with guilt and grief, a bullying leftist media only add to his pain as he spirals downward to the point of suicide. Officer Green and his partner are patrolling an inner-city apartment complex when they happen upon a drug deal in the courtyard in broad daylight. Things turn violent as the drug dealers suddenly open fire on the officers, who then shoot back in self-defense. Tragically, one of Officer Green’s bullets goes through a first-floor apartment window and strikes an 11-year-old girl, and Green runs to her aid. Later, the case comes before Police Commissioner Frank Reagan (Tom Selleck) as his assistant Sid Gormley (Robert Clohessy) briefs him on the details of the incident. Though Sid says that the police officer involved is “fine” and uninjured, Frank wisely points out that such an incident gravely wounds the officer as well. Unfortunately, the little girl doesn’t survive. Frank later meets with Green and offers him the support every officer deserves in such a situation, along with sage advice. Frank: I assume you know about ballistics? Green: Uh, bullet that killed the girl came from my gun. Green: But they opened up on us, Commissioner. We had to return fire. Frank: I read the report. I see no reason to question your actions. Green: ‘Cause on the news, they’re making it sound like I meant to kill the girl. Or could care less. Frank: Best tune out that noise for now. Green: You here to take my shield? Frank: No. I make it my business to check on all my cops when they’ve been hurt in the line of duty. Green: But it’s not like I was injured. Frank: But how are you feeling? Frank: You know, this can be its own kind of injury. Yes. Sometimes, tragedies happen on this job. But that’s not on you. You did your duty. Frank: That’s exactly right. But if you feel the need, the department has resources. Just saying. Such pressure, judgement and criticism from the media and anti-police protesters on those who serve and protect us in real-life can be just as taxing, unfortunately. Blue Bloods did an incredible job of delving even further into exactly what that can do to a human being who is already drowning in guilt and shouldering other life problems at the same time, as Green is. But the pressure takes its toll and Officer Green soon turns his badge in to Frank, clearly distraught about the tragedy and his family situation (he is newly separated). Frank: Maybe you ought to wait for the dust to settle before you make this big a decision? Green: I’ve already thought it through. I loved being a cop, but that time is over now. Frank: We can pull you off the street for a while, put you in an administrative post. Green: Thank you, sir. I appreciate that. But in my mind, I’m already gone. Frank: Well, what are you gonna do? Green: Haven’t really thought about that. Frank: I mean, you can’t collect your pension and benefits yet. Frank: And how about… Your wife and kids? I can tell you, it… It’s kind of a big deal when their cop is no longer their cop. Green: Oh, we live separately, so, it’s not really a part of their day-to-day anymore. Frank: Okay. And how about you? Turning in the shield under these circumstances… Things can kind of snowball. As Frank enters Green’s apartment, he remarks to him what a beautiful family he has as he eyes a family portrait on the wall. “Yeah, we were,” Green says through tears with a gun in his hand. “Stop that,“ Frank says calmly. “You’re living under different roofs right now, but you’re still a family. How long you been apart?” Green says they’ve only been apart for two months, which is obviously a big contributor to his troubled soul. When Green tries to claim that he’s not an officer anymore, Frank speaks firmly yet kindly. “You handed in your shield,” he tells Green, “but your paperwork hasn’t been processed yet, so you still answer to me. 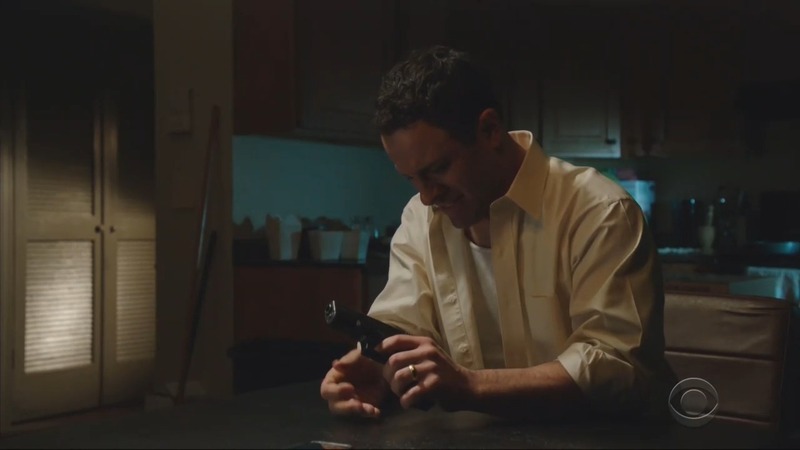 Understood?” Green respectfully answers in the affirmative and Frank begins to help pull him out from the grip of despair, getting him to trade his gun for his old badge, in a scene that is one of the most emotional ones I’ve ever watched on this show. And one that our heroes in blue who serve and protect us everywhere deserve to see, rather than the constant attacks on them in the leftist, anti-police media. Frank: If they hadn’t opened up on you and your partner, she would be alive today. Her death… is on them, not you. Copy? Green: We could’ve backed off. Frank: That’s not what we do. Is it? Frank: My partner and I were returning fire during a bank robbery in East Harlem. One of the bullets from my service revolver hit a young woman in the beauty shop next door. I watched her die on the scene. I tried to shake it. I mean, I didn’t know her from Adam. And then… it occurred to me: She was someone’s daughter. Turns out she was someone’s sister… wife, mother. I tried real hard to block that out. And… then… it occurred to me she was someone’s coworker, someone’s loyal customer, someone’s fellow churchgoer, and on and on. Every little last role she could’ve had in life. Then I got some help. You think you could use some help? Trade you. I’m proud of you. Not only do our police heroes deserve this kind of compassion and support in the midst of a tragic accident, but even when they’re not involved in a tragedy, they still face serious risks every day in order to keep us safe, all while dealing with personal problems, and they deserve respect for that as well. Blue Bloods did an excellent job of proving that blue lives do indeed matter.